The first studio recording I’ve been involved with. We spent a couple of days (I think – details are getting hazy) in our friend Colin‘s living room in early 2002 and came away with five songs. 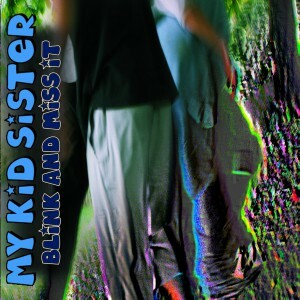 This was recorded and released under our original band name, My Kid Sister. We’d only managed to write five songs in just under a year and a half. Two of the five were mine, It’ll be alright and Trust in you. The general method was for Aaron or I to write a song, and then we’d refine the song as a band with everyone throwing ideas for arrangement into the pot. For some reason I never played on Fearfully, Wonderfully until after we recorded it. I always used it to go and grab a drink and enjoy the other three rocking out. Then when we recorded I had to do actual harmonies. If you listen carefully (should you be lucky enough to own this – we never released it online) you can hear me squawk with terror just before the first chorus. Recording this was so much fun. Kind of ruined any job I’ve ever had since it happened.